All novice smokers, listen up – this 30″ Char-Broil American Gourmet Offset Smoker model #18202078 will lead you to the promise land – and that promise land is filled with deliciously smoked meats. With drawers that are easy-access, supporting efficient water and wood chip replenishment, the Char-Broil American Smoker keeps smoke under wraps with an adjustable chimney vent and the variable heat control makes sure your meats are smoking at just the right temperature. The best part yet however is the welded cooking chamber, a sturdy construction designed to keep the flavor on the inside, just where you want it. Being this smoker is also a grill you can enjoy the convenience of two different cooking methods with one unit. There is also a 40 Inch version of this grill. Read more about the 40″ by clicking here. Bottom line, the Char-Broil American Smoker is light on the wallet. While this can be a bad thing (cheap, unreliable, dime a dozen, questionable quality) at times, in this case, it’s a wonderful perk. 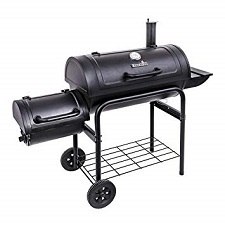 Surprisingly enough, you can find this smoker for as cheap as $120.00 in some places. We already know what you’re thinking – there are smokers out there in the thousand dollar range. This is true, but again, you’re starting out, and for your first smoker, and one that will last, this smoker right here cannot be beat. Some smokers are wood charcoal centric, but not the Char-Broil American. This smoker actually works better with briquettes, and for lots of folks, this is a giant sigh of relief. In fact, the temperature control you get with briquettes on this smoker is really notable. An offset fire box gives way to indirect cooking through your trusty briquettes as it allows for the transmission of smoke at a low heat that emanates throughout the cooking chamber. This is where the flavor comes from. Getting hungry? This is pretty typical of smokers/grills just over $100. They work great, but up to a point. Out of 68 customer reviews, it is rated (at time of writing) a 3.3 stars out of 5 with roughly 56% going to 4 & 5 star ratings for this smoker. Not too bad but other grills scored higher within the same price range. All in all you’d be hard-pressed to find a better smoker for just over $100. This will wet your palate and in time lead you on to that next smoker – a little higher up the “smoker chain.” In the meantime, enjoy what it churns out, because the Char-Broil American has the potential, all it lacks is the meat!